For Sale All Locations, South Carolina, Darlington Washington St. & Governor Williams Hwy. This site is an excellent identity site situated on the US Highway 52 Bypass just outside the city limits of Darlington. The area is an established, yet growing Office/Retail neighborhood providing a variety of consumer goods and services. 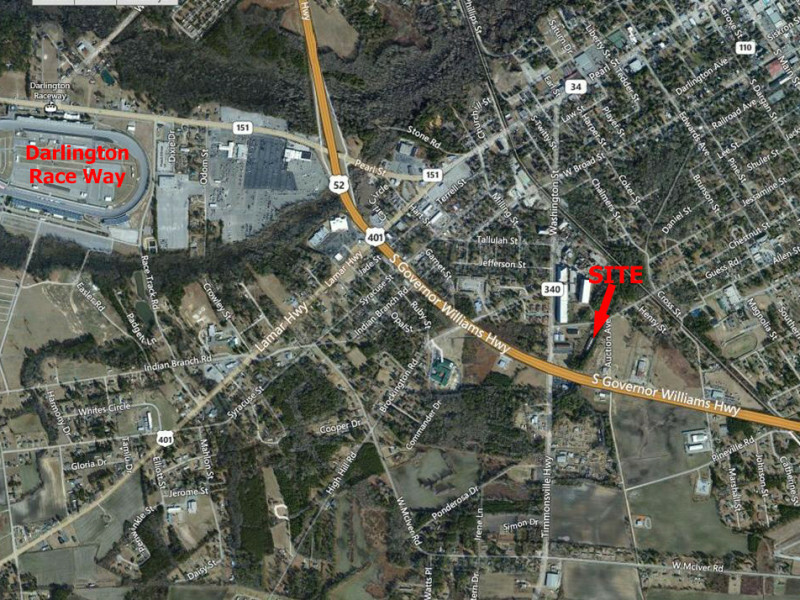 The property is approximately 1 mile from the Darlington Raceway. Just minutes away from the site is Florence, the Pee Dee Area’s economic and business hub. A few miles east traffic flows from the US Highway 52 and Interstate 95 interchange towards Darlington top 30,000 vehicles per day. The site has excellent visibility and can be easily accessed from the highway or two secondary boundary roads. The site is situated at a traffic light corner and has approximately 435 feet of frontage on US Highway 52 Bypass. Water and sewer are proximate to the site. A +/- 14,000 square foot warehouse/storage building sits on the rear portion of the property and conveys with the sale.